I have to admit that I think this is an adorable alphabet match set. The kids are so cute (probably like your own kids, or the kids in your class). Print the cards on cardstock so they hold up longer. 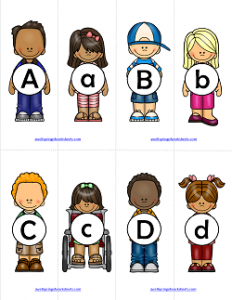 Cut them into separate cards and hand them over to your kids to match the uppercase letters to the lowercase letters. Along with matching letter, they will match girls to girls and boys to boys, but mostly girls to boys. Don’t forget to print out the handy storage box. (This should be printed in cardstock.) It takes only a few minutes to cut it out, fold it and glue it together and it should last a good long time. 52 cards on 7 pages. Go to this page to see all the alphabet matching sets.